Applications must be postmarked no later than July 15, 2018. 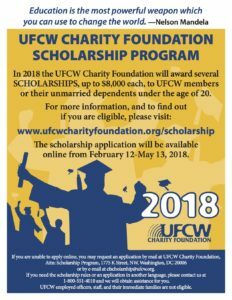 Past winners have gone on to make significant contributions to society and to the UFCW – entering a range of fields including public service, medicine, law, business and teaching. Many have returned to the UFCW as staffers, organizers, and community activists who contribute to our mission. *UFCW-employed officers and staff, and their immediate families are not eligible for this program. 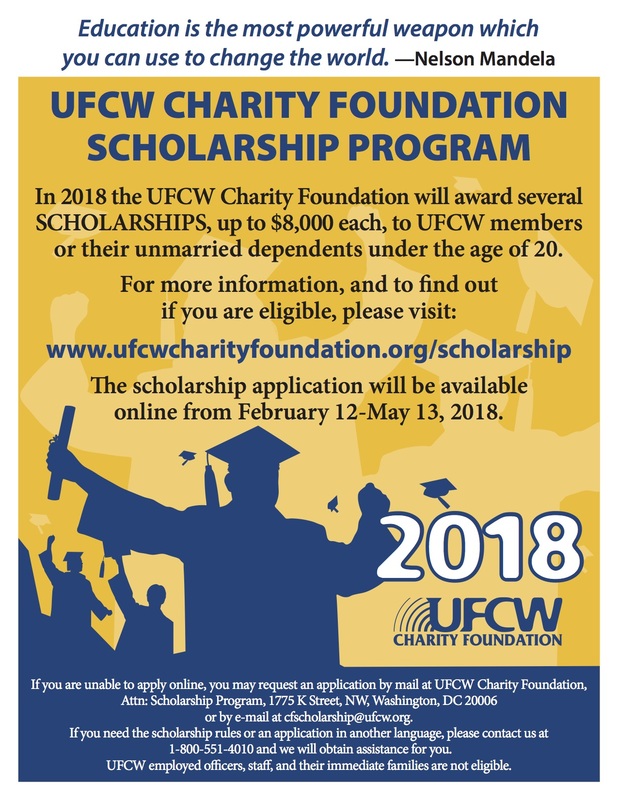 For more information and to complete the application, visit http://ufcwcharityfoundation.org/scholarship/. between the Union and Company, we are pleased to announce that Tyson workers shall also receive a one-time bonus. Full-time workers will receive $1,000; part-time workers will receive $500. Bonus checks will be paid in about three weeks; taxes will be appropriately deducted. To be eligible for a bonus, an employee must have completed his or her probationary period as of February 7, 2018. 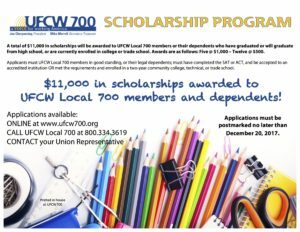 UFCW Local 700 members or their dependents who have graduated or will graduate from high school, or are currently enrolled in college or trade school. Awards are as follows: Five @ $1,000, Twelve @ $500. 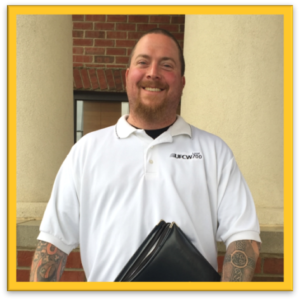 Applicants must UFCW Local 700 members in good standing, or their legal dependents; must have completed the SAT or ACT, and be accepted to an accredited institution OR met the requirements and enrolled in a two-year community college, technical, or trade school. 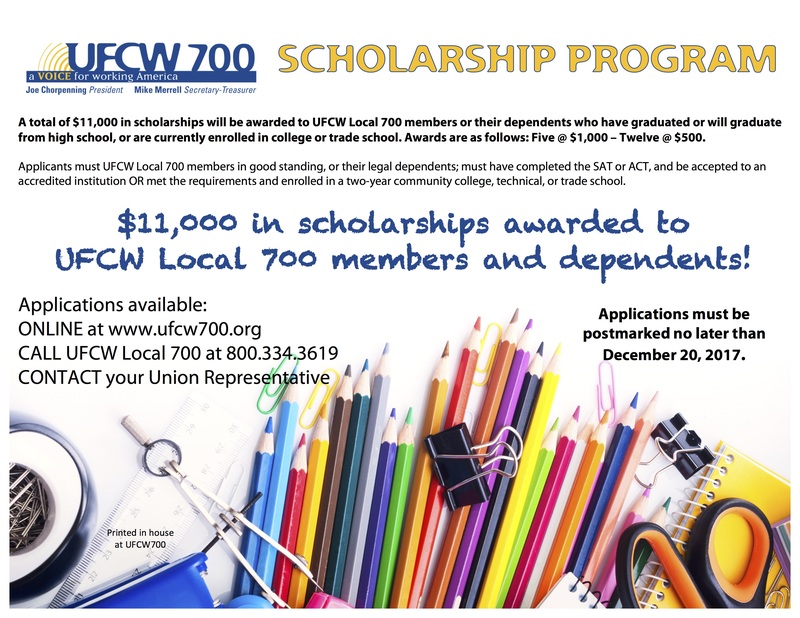 UFCW Local 700 is pleased to award a total of $11,000 in scholarships each spring and fall to UFCW Local 700 members or their dependents who have graduated or will graduate from high school, or are currently enrolled in college or trade school. Awards are as follows: Five @ $1,000, Twelve @ $500. Applications must be postmarked no later than August 11, 2017. 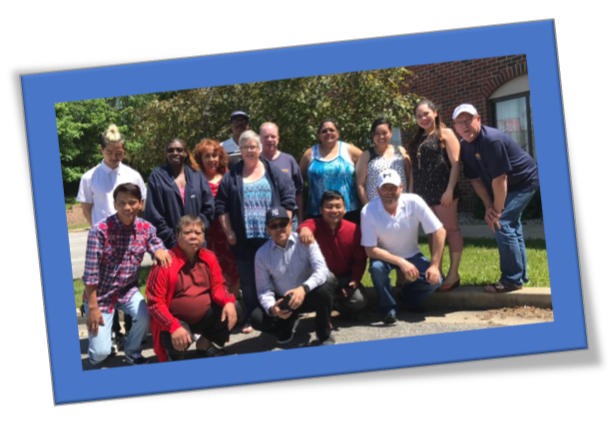 Through the partnership between UFCW and Eastern Gateway Community, UFCW members and your families can earn a college degree – and won’t have to pay out of your own pocket for tuition, fees, or books. Eastern Gateway Community College is a public, non- profit, regionally accredited school; earned credits transfer to other schools. This benefit for members of UFCW can save you and your family members thousands of dollars. Family is defined as spouses, children, dependents and grandchildren. Degree Programs include Associate of Arts; Criminal Justice; Early Childhood Education; Business Management. “I chose Business Management for my degree; the classes are stimulating and challenging. I have an 11-year-old daughter and work 50 hours, 6 days per week, so time is an issue. The instructors are helpful and the administration helped to set up my classes and get me started, which made things much easier. Free is within your budget! Do it on your schedule. You do your work anytime, anywhere. 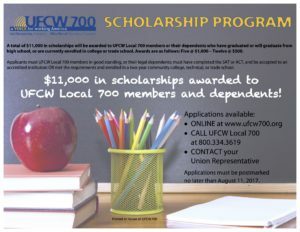 Learn more about the UFCW Local 700 Free College Benefit at www.ufcwfreecollege.org. Thank you for your hard work, as well as everything you do, every day, for our union family. We want to start 2017 by making sure you save money. How? By learning more about the valueand benefits we negotiated for all our hard-working UFCW members. As a member of our UFCW family, not only do you get a contract that provides important benefits, like job security and quality, affordable health care—you also can receive some great membership discounts. These discounts can save you as much as $3,000 in 2017. That’s a lot of money. What kinds of discounts can you and other members get? Please visit UFCW.org/value to learn more about these important benefits and discounts. It’s easy to take these simple steps in order to save money and increase the value of your UFCW membership by up to $3,000 per year. The truth is: You’ve earned these benefits, and we want you to use them. If you have completed 2017 Open Enrollment and have your confirmation number–FANTASTIC–you’re on the road to great medical benefits! Enroll in person at the Fund office, Monday-Friday, 8am-5pm.